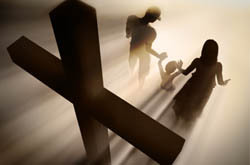 This morning I wrote at MinistryFamily.com about some of the realizations I’m coming to about how my personal spiritual growth influences that of my children. It really is a sobering reality for me. It also seems to be a critical element that often seems to be missing from the conversations I hear regarding a family-based approach to youth ministry: pastors and church leaders are mostly talking about it, not always intentionally living it. The conversation seems to revolve around getting our church members to do something, which is obviously important, but let’s remember that we can’t effectively lead a movement in our churches that we are not first living ourselves. Furthermore, we can’t impress Deuteronomy 6 on our children until we first impress it upon ourselves. Otherwise, our kids rebel against it because it feels forced. It has to be modeled and flow from our own hearts for it to real to them. If our own faith is visible in every area of our life, Lord willing, when our kids graduate from high school, they will not also graduate from the church. Hopefully they remain committed to the church because they’ve received from us a faith that’s strong. As Kenda Dean’s shows in, “Almost Christian: What the Faith of Our Teenagers is Telling the American Church,” the teenagers who have a weak faith did not get that weak faith by rejecting the faith of the church, but by almost perfectly accepting the weak faith of those at home and in the church. It’s not that teenagers have rebelled against what they’ve seen, it’s that they almost perfectly mirror what they have seen. The invisible elements of our faith, like passion and sincerity, can’t be faked. They play such a critical role in the spiritual formation of children and teenagers. They have the ability to become contagious! That’s when faith is caught, not taught, as cliche as that sounds. We really have to care about what’s going on in the heart of the moms and dads in our churches. Not just say we care about it, but care enough to make the necessary radical shifts in our own families and ministries. If the parents in our churches are passionately sold out to the Lord, that is going to mess with their teenagers in huge ways! They’ll see it in their parents’ lives, not just hear it talked about as a compartment of their lives. But kids don’t only need to see that Jesus is real to their parents — they need to see that He’s real to us as youth workers, as well. And their parents need to see a model of what godly parenting looks like. For those of us who work in the church, it can be difficult being a spiritual leader at home. We spend all day praying with people, studying the Bible, and talking about faith matters. By the time we get home, we just want to chill with the remote control and a good TV show. We’re tired. We want to shift gears. But we can’t effectively lead parents in our church if we’re not first leading our own kids spiritually at home. We can only talk about, that’s it. To state the obvious, it’s impossible to live out for others something we’re not living out. What are the 1 or 2 things I need to do at home to be a more faith at home focused individual? What are one or two things you can do to engage parents at your church? Start with baby steps. What are one or two things your church can do to engage parents? In response to the first question, I’m trying to be more intentional about reading Bible stories with my kids every day. Zeke is only 1 year old, but Hannah is 2 years old and can understand pretty much everything we say, so she’s totally ready. She’s even started to memorize some of the old Sunday School songs we sing together, so I know she’s ready to start memorizing scripture, too. I also try to pray with my wife, Dana, twice a week. And I don’t mean just meal-time prayers, but asking her how I can pray for her and then doing so. So far it usually happens while we’re in bed falling asleep at night, but it’s a start. In response to the other questions, Mark Holman pointed out that the order of these is important. We can’t jump straight to, “How do I get my church to do something?” We have to start with ourselves. QUESTION: How would you answer those three questions for yourself and your ministry? Comment below and share!